Successfully Added MP6 Player with 3.5 Inch LCD Screen + DVB-T Digital TV (8GB) to your Shopping Cart. Comparing Products? Search Chinavasion For Alternative: CVMI-E80 (Media Mogul - MP6 Player with 3.5 Inch Touchscreen + DVB-T) The first ever DVB-T digital TV MP6 Player is here. A true MP6 Player supporting VOB and RMVB file formats along with DVB-T digital TV and all your favorite video and music download file types. Excellent in design and functionality, with a crystal clear 3.5 inch LCD display screen, this MP6 Player with DVB-T is the perfect portable entertainment unit for anyone who enjoys their digital media while away from home. This handheld multimedia MP6 Player features simple one-click navigation menus, making playing music, watching videos, or enjoying DVB-T digital TV easy whether you are sitting on the bus or lying on the beach. It comes with a huge 8 gigabytes of built-in flash memory so you can store all of your favorite media files, has a microSD card slot so you can add additional memory to store even more video and music files, and is made of a finely detailed molded casing with a polycarb front panel to protect the inner screen. All these thoughtful details providing you with the most satisfying user experience possible. Similar to our famous "Video File King" PMP, this MP6 Player is a portable media powerhouse capable of playing 20 media file types including download favorites like MP3, VOB, RMVB, FLAC, WMV and MP4. You can simply load any of these files onto your MP6 Player like you would a USB flash drive, with a simple USB connection to your computer. There is no proprietary software necessary or DRM restrictions to worry about. An MP6 Player that has native playback for 20 file types, has 8GB's of internal memory, and includes DVB-T digital TV, what do you call it - the Chinavasion CVMI-N10 of course! A simple and elegant portable multimedia MP6 Player (MP3 + MP4 + MP5 = MP6) the CVMI-N10 plays music, movies, digital TV, ebooks, and more all in one amazing unit. Get yours today at a low factory direct low China Wholesale Price from the leader in wholesale electronics, Chinavasion. Note: This product supports the DVB-T format of digital TV. DVB-T works in most parts of the world, but does not work in North America or certain other special regions of the world. Multiple video supported formats, including RMVB, VOB, DAT, MP4, and much more! 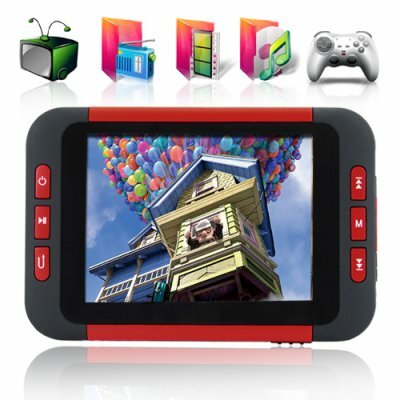 Will this MP6 Player work in North America (United States, Canada, Mexico)? This digital media player will work fine in every county around the world. However, the digital TV function will only work in countries that support DVB-T such as Europe. The N10 is called an MP6 player, what is that? Is it like an MP5 player? There are no such things as MP5 files, so no product can be an MP5 player. However, this product has all the features you see in advertised MP5 players and MP4 players and MP3 players, and also includes a TV function, hence it is called an MP6 player. Actually, this digital media player is so good we should be calling it an MP10 player!! What makes this digital media player better than others I see in my local electronics store? Besides the factory direct budget price, this MP6 Player is easy to use and plays a wide selection of popular music and video file types that is impossible to find in any other PMP in the market today. Plus, it works as a portable digital TV! Can I recharge the MP6 Player via my computers USB port? My DIVX files will not show up, whats going on? Change the file name to MP4, that will solve the problem. It performed its functions well, it played movies wonderfully and I stored thousands of songs on it. Servicio rapido, en 10 días lo tenia en mi casa. Como se suele decir "bueno, bonito y barato"
If you guys had an ATSC version (North America) of this so I can watch TV here in Canada, I would so buy it even if it were $200!! and I would feel more comfortable buying from Chinavasion because of the 12 month warranty and incredible fast shipping! fast delivery and good mp6 player.